Eastbound Interstate 195 lowers from the high rise bridge over the Intracoastal Waterway toward Miami Beach on Julia Tuttle Causeway. Photo taken 03/04/14. Interstate 195 is a freeway spur linking Midtown Miami with northern Miami Beach via the Julia Tuttle Causeway. 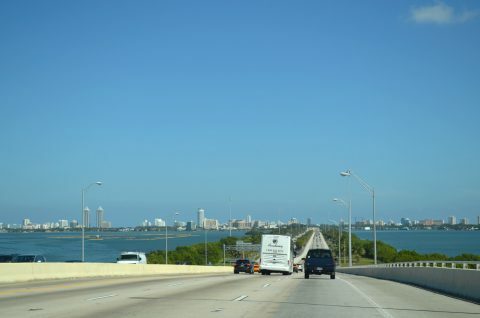 In conjunction with the tolled Airport Expressway (SR 112), I-195 connects SR A1A and Miami Beach with Interstate 95 (North-South Expressway) and Miami International Airport (MIA). Interstate 195 extends the Airport Expressway (SR 112) east from I-95 and the 36th Street Interchange at midtown Miami to the Julia Tuttle Causeway spanning the Intracoastal Waterway and Biscayne Bay. The freeway spurs east into Miami Beach, ending at an interchange with SR 907 (Alton Road). SR 112 overlays all of I-195, emerging along 41st Street (Arthur Godfrey Road) east to the one-way couplet of SR A1A (Collins Avenue north / Indian Creek Drive south). Julia Tuttle Causeway provides part of a direct route between Miami Beach and Miami International Airport (MIA) in conjunction with the tolled Airport Expressway (SR 112 west to SR 953). The freeway also provides one of three hurricane evacuation routes from Miami Beach. A linear cluster of skyscrapers line the Biscayne Bayfront to the southwest of Julia Tuttle Causeway at Downtown Miami. Also crossing the bay to the south are the low level Venetian Causeway and the high rise bridge for SR A1A (MacArthur Causeway). Photo taken 03/04/14. Initial construction for the freeway linking Miami and Miami Beach at the Bayshore neighborhood began in October 1957 along the 36th Street (Julia Tuttle) Causeway across Biscayne Bay.1 Opening to motorists on December 12, 1959 and costing nearly $14 million to build2, Julia Tuttle Causeway was the first link completed in the original Miami expressway system3. It connected Alton Road (Florida 907) on Miami Beach with U.S. 1 (Biscayne Boulevard) on the Miami side via NE 36th and NE 38th Streets. 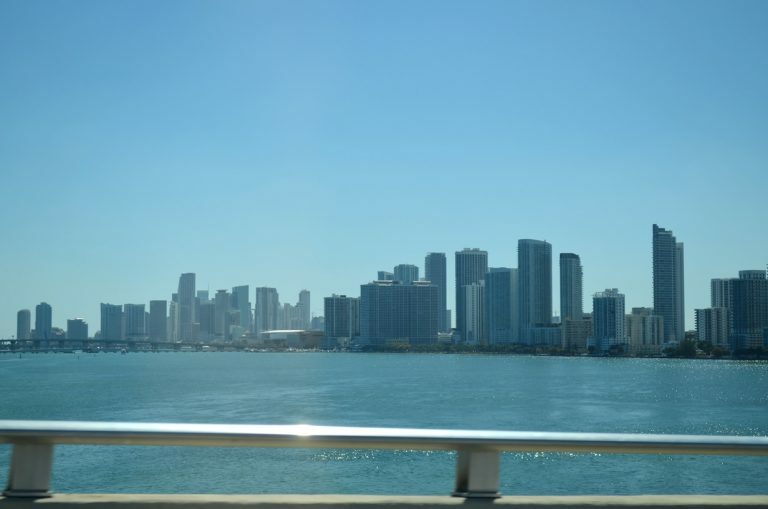 Named after the early Miami pioneer, the Julia Tuttle Causeway consists of two spans over Biscayne Bay: the 2,150 foot long high rise bridge across the Intracoastal Waterway and the 1,138 foot long east channel bridge. A six-lane causeway joins the two bridges. Work on the final piece of the freeway commenced in March 1960 between Biscayne Boulevard and Interstate 95 (North-South Expressway) at the 36th Street Interchange.4 This link included a seamless connection with the tolled 36th Street Expressway (Florida 112) west to Miami International Airport (MIA). Interstate 195 fully opened to traffic on December 22, 19615. According to a 1961-62 FDOT Biennial Report, Business Spur I-195 extended along 41st Street east from Alton Road (Florida 907) toward Florida A1A (Collins Road).7 This designation was short lived however. Traveling east along the Julia Tuttle Causeway across Biscayne Bay, drivers pass by the final reassurance shield for Interstate 195. Photo taken 03/04/14. Exit 5 separates from I-195 east for SR 907 (Alton Road) to the Miami Beach Convention Center, Jackie Gleason Theater and Art Deco Historic District. I-195 curves northeast to end as 41st Street. Photo taken 03/04/14. Guide sign along the off-ramp for Florida 907 south to the Convention Center and north to area hospitals. Photo taken 03/25/06. Historic look at an end sign previously posted ahead of the traffic light with Alton Road (SR 907A) at the Nautilus neighborhood of Miami Beach. This assembly was removed by 2008. Photo taken 12/28/03. 41st Street (SR 112) extends east 0.8 miles from the I-195 end at Alton Road (SR 907A) to SR A1A (Collins Avenue) at Mid-Beach. Photo taken 03/04/14. SR 112 (41st Street) intersects Alton Road (SR 907A) at the westbound beginning of Interstate 195. SR 907A loops east along a section of Alton Road bypassed by SR 907. Photo taken 04/01/14. A directional cloverleaf interchange joins I-195 and SR 112 with SR 907 ahead of Julia Tuttle Causeway west across Biscayne Bay. SR 907 follows Alton Road north from SR A1A (5th Street) and South Beach to SR A1A again at 63rd Street in North Beach. Photo taken 04/01/14. The first reassurance shield for I-195 west precedes the east channel bridge of Julia Tuttle Causeway. Interstate 95 lies four miles to the west, while SR 112 reaches Miami International Airport (MIA) in eight miles. Photo taken 04/01/14. SR 907 partitions with Alton Road (unsigned SR 907A) ahead of the interchange with Interstate 195. Alton Road connects with 41st Street (Arthur Godfrey Road) east to SR A1A (Collins Avenue). Photo taken 07/27/17. A loop ramp follows from SR 907 north for Interstate 195 west to Miami. Photo taken 07/27/17. Interstate 195 elevates over U.S. 1 (Biscayne Boulevard) and a three block stretch along a viaduct just ahead of the 36th Street Interchange with Interstate 95 and Florida 112 west. The four-level interchange was completed in 1961 at a cost of $22 million. Photo taken 04/01/14. A three-lane off-ramp (Exit 1) departs from I-195 west for both directions of Interstate 95. Florida 112 emerges as the tolled Airport Expressway en route to the Brownsville community and Miami International Airport (MIA). Photo taken 01/24/16. Two lanes separate for both I-95 north to Fort Lauderdale and I-95 south to U.S. 1 (Dixie Highway) and Coral Gables. Fort Lauderdale is located 24.7 miles away in neighboring Broward County while Downtown Miami is a 3.4 mile drive to the south. Photo taken 04/01/14. Paralleling a Metrorail line, Florida 112 (Airport Expressway) east travels another 0.75 miles to the 36th Street Interchange with Interstate 95. Photo taken 01/24/16. An all electronic toll (AET) collection gantry precedes both the NW 12th Avenue off-ramp and the four-level interchange with Interstates 95 and 195. Tolling along all of SR 112 commenced in 2014. Photo taken 01/24/16. The adjacent Metrorail line turns south across the Airport Expressway as SR 112 prepares to transition directly onto I-195 east to Miami Beach. SR 112 continues east as the hidden counterpart of I-195 to Alton Road (Exit 5) at Miami Beach. Photo taken 01/24/16. Three lanes partition from the Airport Expressway east for Interstate 95 north to Fort Lauderdale and Broward County and Interstate 95 south to Downtown Miami and Coral Gables. Photo taken 01/24/16. A separate ramp leaves for the tolled I-95 Express Lanes (formerly HOV lanes) northbound as traffic partitions for mainline I-95 north to Fort Lauderdale and Orlando (via Florida’s Turnpike) and south to Downtown. Photo taken 01/24/16. Flyovers from both the Airport Expressway mainline and adjacent NW 39th Street elevate and combine ahead of the I-95 Express Lanes. The toll lanes run northward to Broward County. Photo taken 12/28/06. Older guide signs posted as the Airport Expressway eastbound entered the 36th Street Interchange. Photo taken 12/28/06. Sign replacements made on the ramp for I-95 switched out the HOV 2+ reference for the Sunpass Only Express Lanes while dropping Orlando for All Exits. Photo taken 12/28/06. One mile ahead of the systems interchange with I-195 east to Miami Beach and Florida 112 west to Miami International Airport (MIA) on I-95 (North-South Expressway) southbound. Photo taken 03/04/14. The tolled Express Lanes along I-95 south meet a dedicated left ramp to Florida 112 (Airport Expressway) west in one-half mile. Currently there is no access to I-195 east from the Express Lanes. Photo taken 04/01/14. One lane leaves the I-95 Express Lanes for State Road 112 and the Airport Expressway while the mainline will reach the 36th Street Interchange in one-half mile. Photo taken 04/01/14. Drivers depart on a three lane ramp (Exit 4) to Interstate 195 and Florida 112 along I-95 south. Express ramps rise in the median of the North-South Expressway to meet Florida 112 west as well Photo taken 03/04/14. Traffic partitions along Exit 4 for both the Airport Expressway west 5.2 miles to MIA Airport and Interstate 195 east 5.2 miles to Florida A1A (Collins Avenue) in Miami Beach. Photo taken 03/04/14. The forthcoming ramp (Exit 4A) for I-195 consists of a flyover taking motorists over merging traffic from I-395 west and Florida 836 east. The ramp returns to the I-95 mainline, forming an auxiliary lane to Exit 4B with Interstate 195 directly. Photo taken 03/04/14. Spanning over the Interstate 395 eastbound mainline, Exit 4A to the I-195 bypass ramp leaves I-95 north. The ramp will rejoin the mainline north of NW 20th Street. Photo taken 03/04/14. Interstate 95 north passes over NW 20th Street on the one mile approach to I-195 east and Florida 112 west (Exit 4B). The bypass ramp for Interstate 195 bound traffic (Exit 4A) comes into view. Photo taken 09/30/17. The two left lanes along I-95 north become dedicated toll Express Lanes ahead of the 36th Street Interchange with I-195 and Florida 112. Photo taken 09/30/17. Exit 4B splits for I-195 east and Florida 112 west. Ramps connect Interstate 195 with Miami Avenue (Exit 2A) and U.S. 1 (Exit 2B) before the freeway crosses Biscayne Bay along Julia Tuttle Causeway. Photo taken 09/30/17. Florida 112 stems west from I-95 and I-195 to Miami International Airport (MIA) at U.S. 27 and Florida 948 (NW 36th Street). Photo taken 04/01/14. “36th St. Span To Start By October 21”, The Miami News, September 20, 1957. “We Bridge The Gap”, The Miami News, December 12, 1959. “36th St. Span Ready To Roll”, The Miami News, December 7, 1959. “Work Will Start Soon on Miami Expressway”, The Miami News, March 17, 1960. “X-Way Opens – Snip, Zip!”,The Miami News, December 22, 1961. Learned, Jason. “Interstate Guide – Florida I-195, I-395, I-595.” Personal email, November 25, 2003. “Twenty-Fourth Biennial Report of the State Road Department (Florida) – Jan. 1, 1961 through Dec. 31, 1962” (online document). Page updated November 2, 2018.